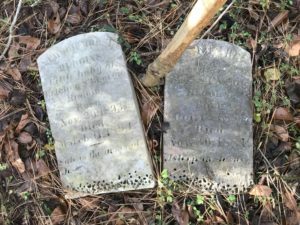 The Fairfield Foundation is coordinating a Cemetery Preservation Day in Mathews County. Read on to learn how you can be a part of this exciting project! 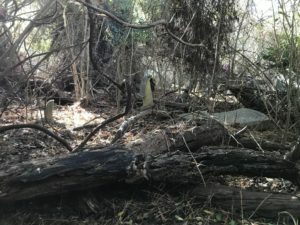 The Brooks cemetery is overgrown with trees and brush. The New Point Comfort Natural Area Preserve in Mathews County is beautiful for many reasons. The boardwalk provides fantastic views of the Chesapeake Bay, salt marshes, and maritime forests, perfect for nature-viewing and bird-watching. In the distance you can see the New Point Comfort Lighthouse, built in 1805 and listed on the National Register of Historic Places since 1973. When the lighthouse was constructed it connected to the mainland; since then, erosion has steadily washed the peninsula away and widened the distance between the lighthouse and shore. Today it sits a full half-mile into the bay. Two of the oldest headstones at the Brooks cemetery. Left: The stones, one on its side, are surrounded by brush. Center and Right: close-ups of the stones. There are other resources not so clearly visible at first glance. If you follow an old, overgrown road into the forested area of the preserve, you will come across a long-overlooked archaeological site. The Brooks site consists of a cemetery and two probable house sites, all overtaken by trees and brush. Like the rest of the peninsula, it stands in constant threat of erosion and destruction by other natural processes, and we want to document it while we still can. Our first effort will focus on the cemetery. 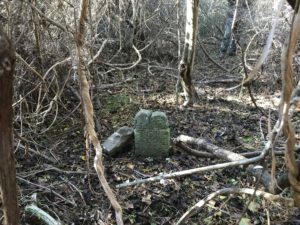 Many headstones are toppled over and displaced, and there are likely more hidden beneath layers of vines, branches and leaves. 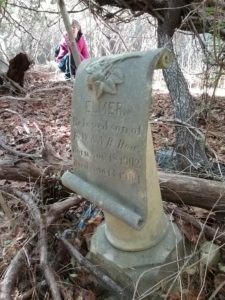 We are optimistic we can clean up this site and rediscover the resting places of Mathews residents from the 1820s through the 1940s, but we can’t do it alone! 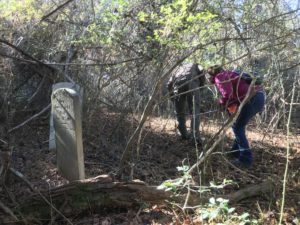 We will be leading a community Cemetery Preservation Day on January 27th from 10am-4pm, when we plan to remove brush from the cemetery and search for lost grave sites. Everyone is welcome to stop by, but please email and register with us beforehand if you want to lend a hand. Left: A remarkable stone for Elmer Dow, who died as an infant. Right: Two fallen stones, one for infant Douglas Hudgins. This work, made possible by a Threatened Sites Grant from the Virginia Department of Historic Resources, will pave the way for continued documentation and preservation of the entire Brooks site, including archaeological testing around the house sites and mapping the cemetery. Our goals are to draw attention to these irreplaceable resources and to help the Nature Conservancy with future planning, preservation, and interpretation of the site. Please join us to learn about the importance of historic preservation and help us document this threatened resource. 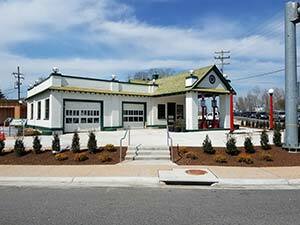 We would like to thank the Virginia Department of Historic Resources for the Threatened Sites Grant and their support of this project and the Nature Conservancy for granting us permission to do work in the Natural Area Preserve. 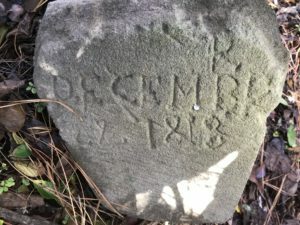 Hello, we are interested in possibly helping, can you tell us where this Cemetary is located? 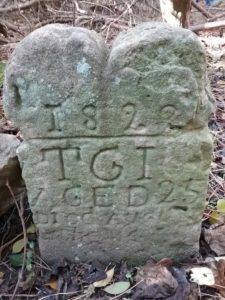 The cemetery is located in the New Point Comfort Nature Preserve at the southern tip of Mathews County. This link should give directions from Mathews Courthouse. I have relatives in this cemetery and would love to participate. I can bring loppers, weed eater with a blade and lot’s of hand tools. My GG Aunts home still stands on the beach there. My Mother is a Hudgins. We have Tomlinson, Brooks, Hudgins etc in the cemetery.